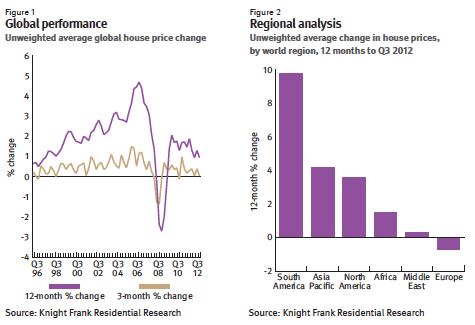 Knight Frank’s Global House Price Index is published quarterly and tracks the performance of mainstream national housing markets around the world. They use Case Shiller results for the US market. With the Eurozone now in its second recession in three years buyer confidence is at an all-time low and it is no coincidence that all the bottom 12 rankings are occupied by European countries this quarter. But it’s not all bad news. Six markets recorded double-digit annual price growth in the year to September; Brazil, Hong Kong, Turkey, Russia, Colombia and Austria. 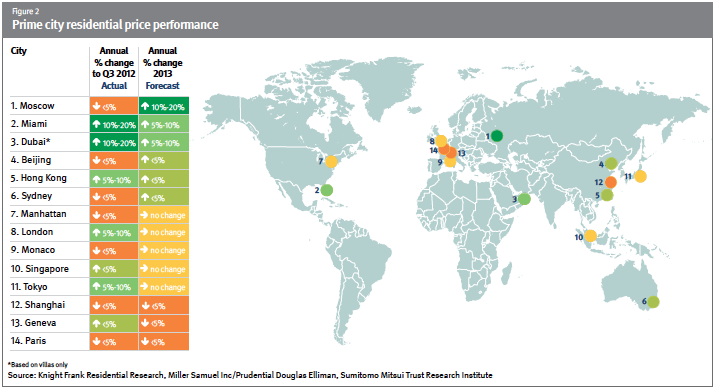 • In 2013, we expect prime residential prices across the 14 cities included in our forecast to rise by 2.5% on average, with Moscow, Miami and Dubai being the strongest performers. • A sharp slowdown in the global economy is the highest risk for the world’s prime residential markets closely followed by government cooling measures. • However, the current economic uncertainty is also considered a key driver of demand in prime cities as HNWIs seek the shelter of ‘safe-haven’ investments. • Supply, or the lack of it, will be a key determinant of price performance in cities such as New York, Moscow and Miami in 2013. • We envisage that government-imposed regulatory measures will keep a lid on price growth in Asia in 2013 but the west-east shift in the economic balance of power suggests more promising prospects in the medium term.